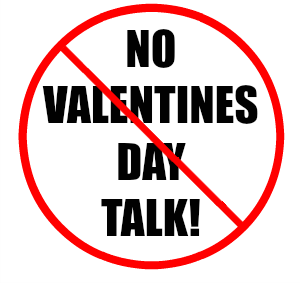 Valentines Day, a day which occurs annually on the 14th of February, a day celebrated by countries worldwide, a day that makes so many of us become poorer, a day that supermarkets and restaurants love, but a day that so many of us loathe! Don't get me wrong, I am the biggest lover of love! I just love relationships and love seeing people happy in love (I tried to type that without Gemma Collins voice in my head!). I'm in love myself romantically, to my gorgeous Gareth, but there's something about Valentines day that irritates me like no other celebrated day! I can understand why we celebrate our birthdays, Easter and Christmas once a year, however why do we have to celebrate love once a year!? Why do we not embrace our love all year round? Why on this one day of the year is it important to get whisked away on a fancy date? Why do we need to go out for dinner in a restaurant on this particular day when we can go for dinner any day of the year? Maybe you need one for yourself at work when another co-worker receives a bunch of flowers, or your boss just announced to the whole office she's leaving early because she's being whisked away for the weekend, but you need to stay till usual home time! Or maybe, you'll be the friend who comes to a singletons rescue? Chocolate, and lots of it! 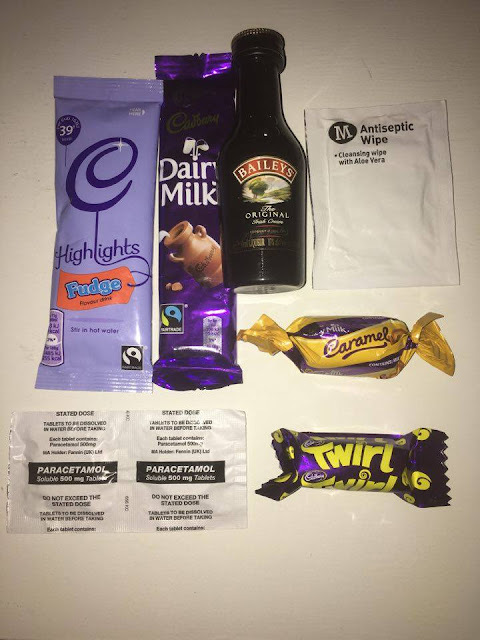 A miniature bottle of alcohol and or hot chocolate sachet! Antibacterial wipes to wipe away the love germs. P.S you'll also need some bubble wrap for the miniature alcohol bottle, (pop the bubbles for added stress relief benefits!) something I don't have at home right now! Oh and maybe some pocket tissues, in case your brain can't cope anymore and you cry at the thought/sound of love! If this is not something that's up your street, why not just pull a sickie? Or if that's not acceptable you could wear a badge to work letting people know exactly what you think of the over rated day! Or finally, why not celebrate the day alone? Buy yourself some chocolates, treat yourself to dinner, and go and watch a movie!